All our started dogs have gone through obedience, advanced obedience, collar conditioning, force fetched, are completing marks out to 75 yards and have been introduced to doubles. Our started dogs are hunting upland cover and are finding, pointing, and retrieving birds in the upland and have had plenty of birds shot over them. Started dogs come with a 28 month hip and eye guarantee and all the health clearances. Jax is will be ready May/June of 2019. He is a really good looking boy who weighs in at 72 pounds. He is a little over a year old and is doing really well. He is very intelligent and picks things up quickly. Jax has a lot of drive and yet is super friendly with kids and the entire family. He really loves to please. He is a great marker already and has a ton of go on retrieving work. 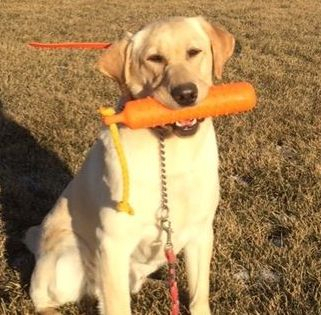 Jax will make an excellent upland and water dog as well as a great family companion.